Historically, the manufacturing industry has been rather slow to adopt new technology. However, with the rise of machine to machine learning and the invaluable data it provides, best in class manufacturers are adopting new technology and investing in cloud services. ● More informed decisions from insight into equipment. ● Sharing data more efficiently across multiple locations creating a more streamlined information sharing process. ● Inventory control and planning making the supply chain more efficient. ● Increasing the manufacturing cycle time, which directly impacts revenue. All of these cloud services produce a high volume of data, and in turn, the data will need to be securely stored and protected. 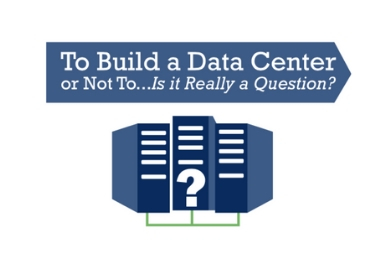 To Build a Data Center or Not To…Is it Really a Question? When it comes to storing data, a manufacturing company has choices. You can build your own data center or you can outsource this service and pay to have your data stored in an off-site secured data center. Building a data center on site is a very expensive investment. It requires investments in equipment, physical space, temperature control, IT personnel and more. Furthermore, if a disaster occurs (flooding, weather etc.) you’re at risk for permanent data loss. Or you could simply rent space from a managed IT services company who make it their business to make sure your data is backed up, secure and available (uptime). Most manufacturers will know exactly how much it costs them to be down for every hour. The number is usually pretty staggering and therefore, uptime is a major consideration when it comes to choosing a managed IT service. Professional data centers will build in redundancies to protect data. The more redundancies in place, the higher the percentage of uptime is offered. Uptime is also known as availability. Data centers will offer pricing based on the various 9s that they offer. 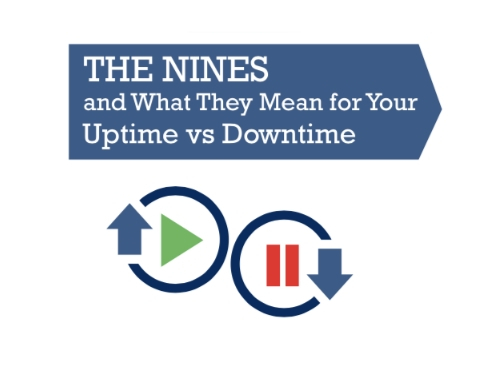 The 9s correspond with the number of 9s in the percentage of uptime. When a manufacturer works with a managed IT services company like ours they essentially rent space in our data center. We supply the equipment, integration or migration of your cloud services data and monitor it 24/7. Additionally, we are looking at how employees are accessing cloud services, usually through a web application firewall (WAF) or VPN connection to ensure the connection is secure. Some manufacturing clients prefer to start off with a smaller data center. This prevents them from making a large investment in a data center that is too big for them. Starting smaller allows us to help advise what the client needs to fit their business as they grow. Software, hardware, security and licensing are a rapidly changing environment. We help our clients by remaining current on all of those issues so your information technology can remain up to date and our clients can focus on their business. Having a managed IT services company handle your IT can also be helpful by utilizing their experience. At Netlink Solutions, we have a vast amount of experience in this field and have seen a lot of what works and what doesn’t. Utilizing a company like ours for our experience can have a direct impact on uptime and efficiency. The manufacturing industry is experiencing what some people have called the “4th Industrial Revolution.” Cloud services are helping manufacturers stay relevant and competitive. As with any adoption of new technology, there are growing pains to work through. Having a managed IT services company on hand can help ease the transition and increase uptime.